The only thing better than our spectacular event facilities and gorgeous setting is our attention to detail! We’ll go the extra mile to ensure your private function is picture-perfect from beginning to end. There is a variety of event packages to choose from and the option of customising services to meet your needs and fit within your budget. From cocktail parties and anniversary dinners to Christmas luncheons and memorial functions, you and your guests will enjoy a top class experience and gracious hospitality. 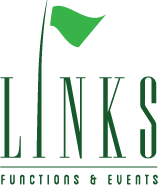 Links Functions and Events is a premier hospitality provider. Our desire is to not only give you the most incredible day of your lives but also to provide a magical experience for your guests.